It is almost a month… >almost< since the last music post. Since then, my iPod is in danger of permanently dying… I can’t think of all the Last Played/Play Count data that will be lost, add that to the fact that some backed-up music doesn’t have the correct song information such as year, track number or even album. BUMMER. My 4-Year-Old iPod – CPR! Yesterday, my iPod suffered an accident, and it’s been on the border of a permanent coma. Connected through the USB cable to my Frankestein PC desktop, I tripped over the cable and it fell on the hard cold floor. I had dropped my iPod before, and apparently… it’s been taking its toll. One of the problems that began happening is that Windows XP wasn’t recognizing the iPod, iTunes crashed… and I ended up restarting my computer more than a few times before I decided to disconnect it all. Once again, I disconnected all and restarted the system as I connected my iPod directly to the electrical outlet with the firewire. 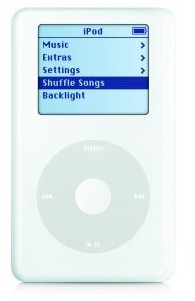 It seemed to work that way, and I hadn’t lose any of the 3000+ songs I’ve got in it… over 14Gb of music. When I woke up today, everything seemed to work fine, and I set up the music that I wanted to listen while doing some studying, when all of a sudden everything stopped playing. Most of the songs I tried playing showed that little exclamation (!) sign when iTunes can’t find the original file. After that, Windows and iTunes began acting weird again, and it did so in another computer. After a few more restarts, I plugged the iPod to the electrical outlet once again, and let it rest there for a while. iPod is working once again… and songs that showed up as missing are playing fine. My faithful 4-year-old iPod that accompanied me through so many sleepless school days during finals, during so many hours on a plane… and terrible endless waits in airports around the world. ~~~ There won’t be a replacement for my 4th generation iPod, just like there’s no replacement for my worn-out Adidas, which I bought in 2001 and have carried with me around the world… endured terrible rain, mud, moss, extremely long walks. Beijing, Beijing, Wo Ai Beijing – I Love Beijing Lyrics! So continuing with Olympic spirit! You know that song each time they go to commercial break??? At least that’s what happens on ATV xD~ Here’s an IMEEM Link + Pinyin Lyrics! Woo!! !